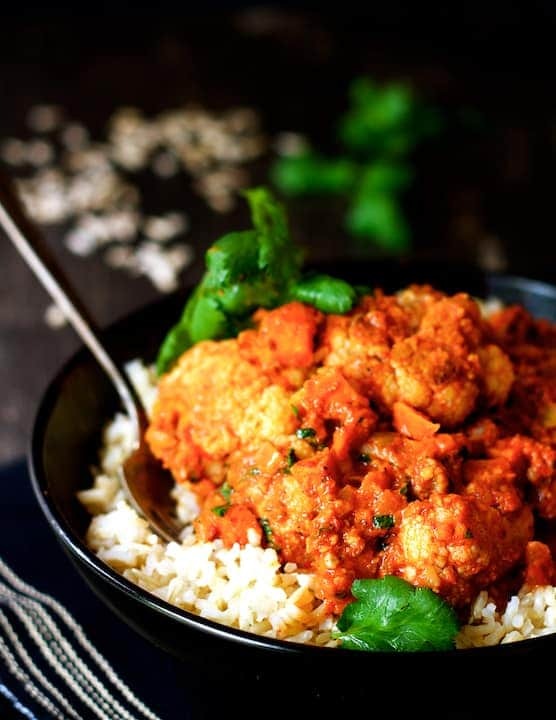 Cauliflower and Sweet Potatoes in Roasted Red Pepper Mole is a lively Mexican-inspired vegetarian dish with complex flavors! You won’t miss the meat! As you might be able to tell, I’ve been on a roasted red pepper kick lately! I’m always amazed at the taste transformation that occurs in a red bell pepper when roasted and how it goes from sweet to rich, earthy and complex. The best and tastiest roasted red bell pepper is one that you roast yourself. It’s not a complicated process, it’s just time-consuming. You can roast peppers under a broiler, but you’ll need to watch them closely. Instead, I roast them in a super-hot 450-degree oven near the heating element (which in my oven is at the top). It takes a little longer, but I don’t have to watch them as closely. Turn as necessary to char them evenly. As they blacken and blister, you’ll see the skin start to pull away from the rest of the pepper. Another roasting option is to hold them over a gas flame, but that takes too much time for me. Immediately upon removing from the oven, place a sheet of aluminum foil or another baking sheet over the peppers. (You want to fully enclose them.) Let them sit for about 20 minutes. The steam produced will allow the skin to pull off easily. If a little stays behind, I don’t worry about it. When peeling and removing the seeds, resist the urge to do it under running water. It might make it easier to get the seeds out, but you’ll be rinsing away flavor. If using roasted red peppers in a jar, make sure they’re packed in water–not a brine. Here’s a taste test conducted by The Huffington Post you might find helpful. Moles are common in Mexican cuisine and always include some type of chili pepper, nut or seed and various spices. The preparation can be quite involved and the deep, richly flavored sauce that results is generally best paired with meat or poultry. 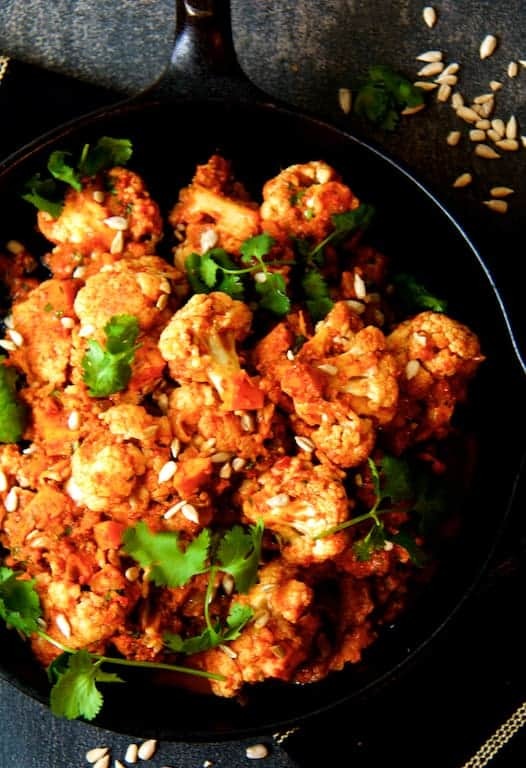 My version with red bell peppers as the base is perfect with vegetables–in this case cauliflower and sweet potatoes–for a satisfying vegan meal. Rather than cooking the cauliflower in the sauce, I roast it while the bell peppers steam. I L-O-V-E roasted cauliflower and feel the texture is better maintained this way. Simply heat through in the sauce at the end. Preheat oven to 450 degrees. Line a baking sheet with parchment paper or non-stick aluminum foil. Rub red bell peppers with olive oil. Place in the oven and roast for 30-45 minutes or until blackened and blistered. Immediately cover with aluminum foil or baking sheet. Let stand 20 minutes. Peel the peppers and transfer to a food processor or blender. Alternately, drain the jar of peppers and place in a food processor or blender. Reduce oven temperature to 400 degrees. Toss cauliflower with olive oil and season liberally with salt and black pepper. Roast for 15-20 minutes or until slightly tender and lightly browned. Set aside. Combine cumin, coriander, oregano, paprika, cayenne and thyme in a dry, non-stick skillet. Heat over medium-high heat for 30-45 seconds, stirring often until fragrant, being careful not to burn the spices. Remove from heat and transfer to food processor along with roasted red pepper. Place sunflower seeds or almonds in the same non-stick skillet, reduce heat to medium and toast until lightly browned in places, 2-3 minutes. Gently toss the almonds every 30 seconds or so to toast more evenly. Transfer to food processor, add garlic and process until smooth. Set aside. Heat 2 tablespoons olive oil in the skillet over medium-high heat. Add onion and cook 5-6 minutes, stirring often until softened. Add sweet potatoes, broth and red pepper mole. Bring to a simmer and cook 8-10 minutes or until sweet potatoes are tender. Add cauliflower and cilantro and heat through. Adjust seasoning with salt, black pepper and cayenne if desired. Garnish with cilantro sprigs and sprinkle with sunflower seeds if desired. Serve immediately with brown rice. Mole may be made up to 1 day ahead; refrigerate. Blanched, slivered almonds may be used in place of sunflower seeds. This is the perfect hearty and flavoursome recipe for me to make for my vegetarian family. I just love all that rich sauce going on! I love roasted peppers and the thought of turning it into a mole is genius! Thanks, Lauren! I think this is a super-tasty combination. Hope you enjoy!